Ok friends. It is no secret how much I love Lara Casey around here. I mean, each month I use the Powersheets she created as a way to flesh out my goals and help me see where I want to make progress. I have followed her blog for quite some time now and am so inspired by her honesty and her desire to live an intentional life in the thick of where God has her. I read her first book, Make It Happen, and was inspired to take my blogging and writing seriously by investing more time in a place that was no longer "just a side thing." I've followed her gardening journey and was so inspired that I decided to finally take the plunge and start my own garden. To say that she's been a distant mentor would be an understatement. So when I saw that she was writing another book, I couldn't wait to get my hands on it. 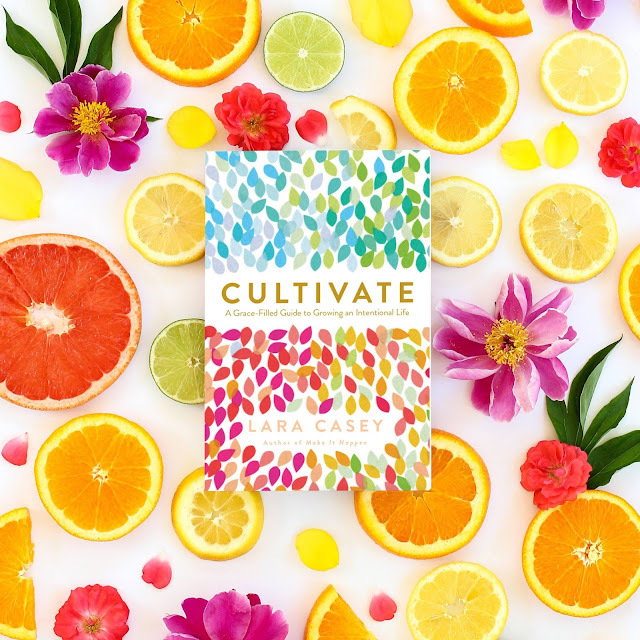 In Cultivate: A Grace-Filled Guide to Growing an Intentional Life, Lara does everything she can to assure the reader that she is just like you. She's just a woman who wants to do everything in her power to live her one life for the glory of God. And what's beautiful about her mission is that she wants you to know that you can do the same. Yes, she is a well-known business owner, writer, and sought-after speaker. But at the end of the day, she is a wife to one, mama to three, and a woman who loves the Lord her God with everything in her being. And that, my friends is not intimidating, but rather inspiring. 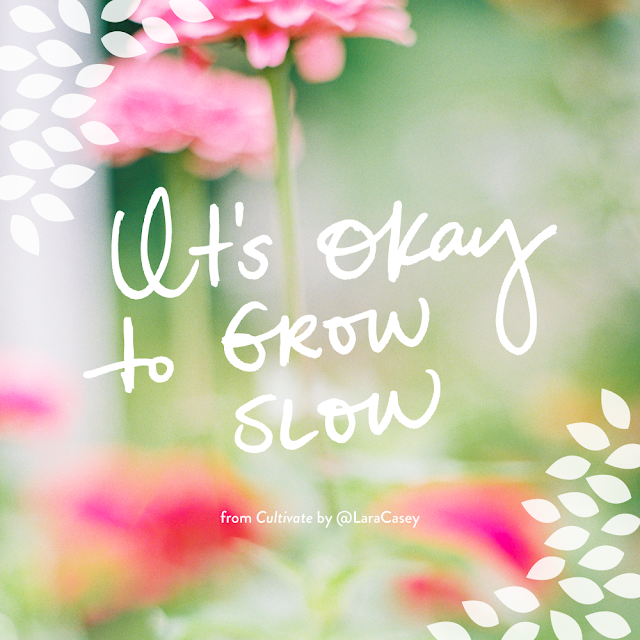 As I read through Lara's story of walking through loss, miscarriage, the adoption process, and stepping back from her business in order to spend time with her family, I was struck with the realization that her life was not that different than mine. We have different stories, but we have similar desires. She's a creative woman who wants to inspire women to use their gifts and talents for the Kingdom. She wants to love her family well and invest in her neighbors. Kindred spirits, I'd say. Reading Lara's gut-wrenchingly honest words about her struggles with anxiety and depression, tears streamed down my face. Lara unpacks ten common lies that we believe, addressing comparison, selfishness, and sins that we try to ignore because they're "not that bad." It is so easy to think that you're alone in your struggles until one day, God reveals to you that you're not. No one is alone in their struggles, and as Lara so bravely shared in her book, "Coming undone is part of coming alive." We have to surrender in order to receive the best that God has for us, which is so much more than we could ever imagine. With beautiful vignettes that reflect the heart of a woman who loves to garden and cultivate and tend to what matters, Lara shines the light of the Gospel. I was deeply moved by her words and will be reading and re-reading them in order to implement the small steps of progress toward letting go and living the abundant life that God has called me to. If you're in need of encouragement right where you are, then this book is for you. You will be encouraged, convicted, and challenged to take a step back and ask yourself, "Am I living the life I want to live?" But the best part? You'll have the tools you need to change what you want to seek the life you desire and sow into the places where God has you. I received this book in exchange for my review from the publisher. The opinions I have expressed are my own.